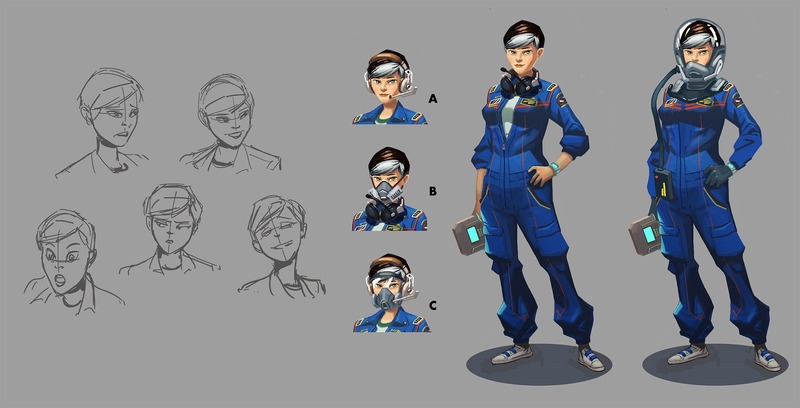 For most people, Star Control: Origins will be the first Star Control game they've ever heard of. But long ago, back in the DOS days, there was a trilogy of Star Control games. The first Star Control game was essentially a Space Wars style game with a strategy layer. There wasn't really any "lore" with it. 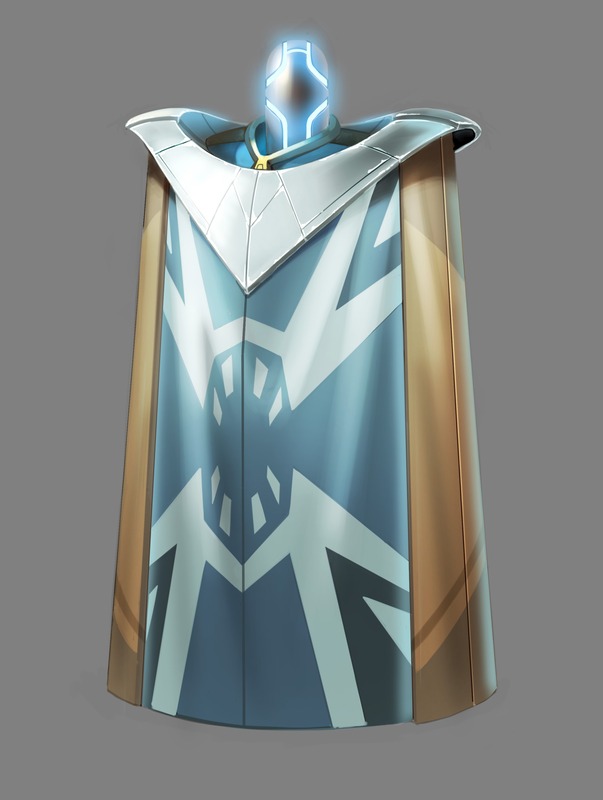 The second one, my favorite, was Star Control II: The Ur-Quan Masters. This game was filled with an epic lore that dated back over a quarter million years. The third one, Star Control III: The Kesari Quadrant, took its own direction, which many fans have since come to not care for. 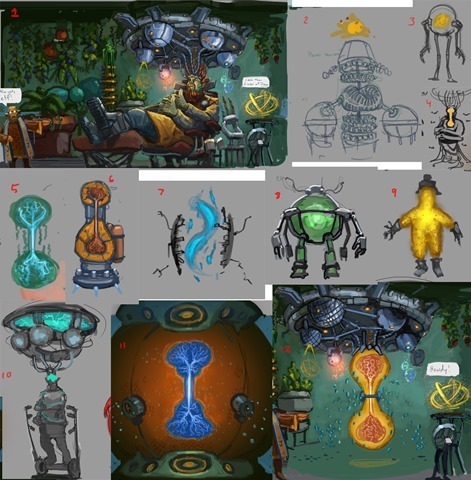 When we began working on Star Control: Origins we had the challenge of deciding what was and wasn't canon in the Star Control universe. Ultimately, what we decided was to make Star Control a multiverse. Thus, Star Control II took place in what we call the Ur-Quan universe. 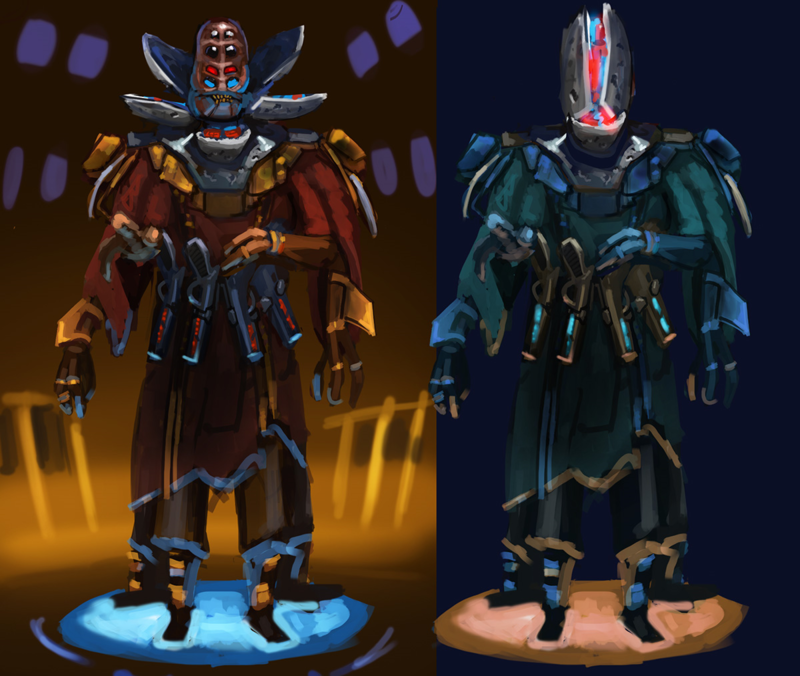 Star Control III takes place in the Kessari universe, and Origins takes place in the Origins universe. 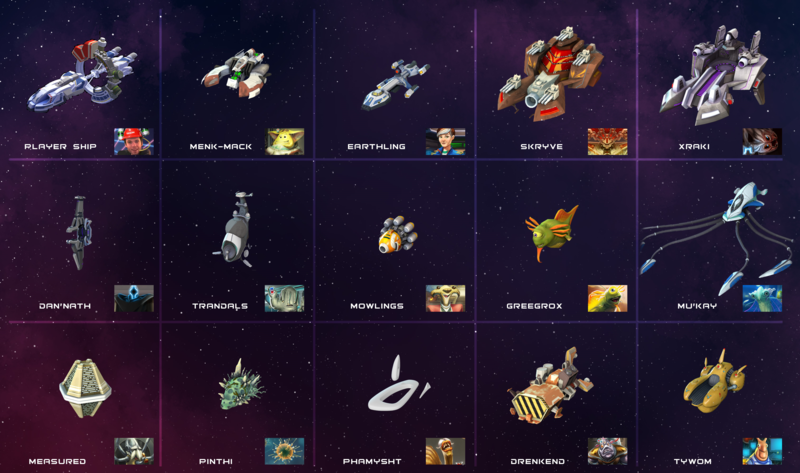 Star Control: Origins main cast as originally conceived. Many of the aliens and ships have gone through a great deal of iteration since then. 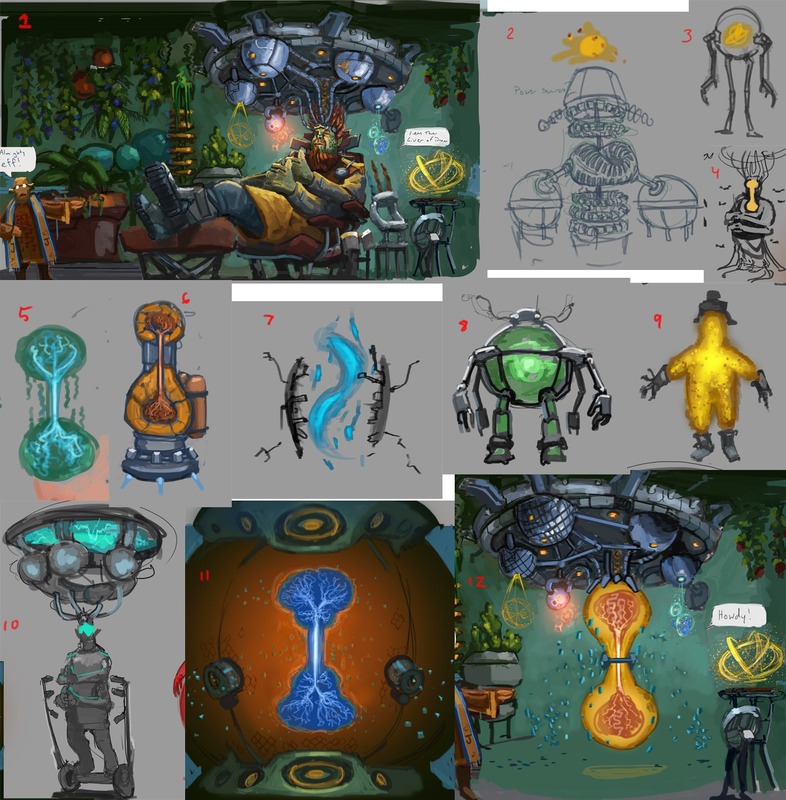 The first step in creating an alien was to brainstorm different shapes as seen below. 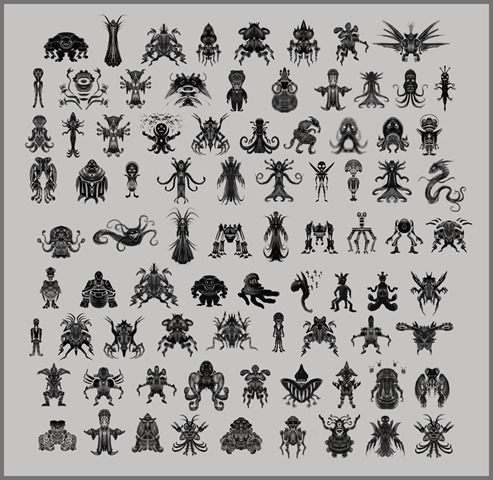 The artists would sketch hundreds of alien ideas for the designers to choose from. 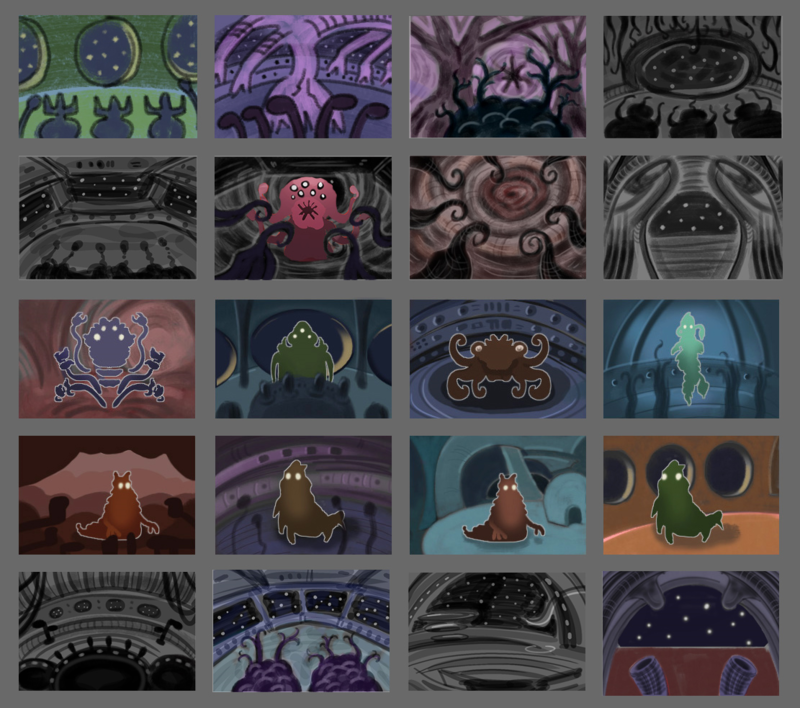 The next step was to start playing around with color. How would they be expressed to the player? Then we start to pick out aliens we might want to run into. Very often, we would get all the way through and decide that an idea just didn't work out. The Measured is a great example. Look at the Measured above and then The Measured in the very first screenshot. 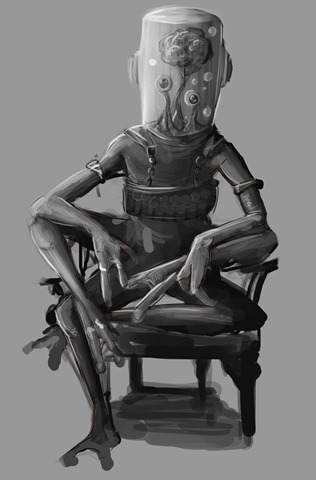 They originally were much more human-like with eyes and all. But we ultimately went in a very different direction. And sometimes, we'd finish it all and decide they just didn't fit. 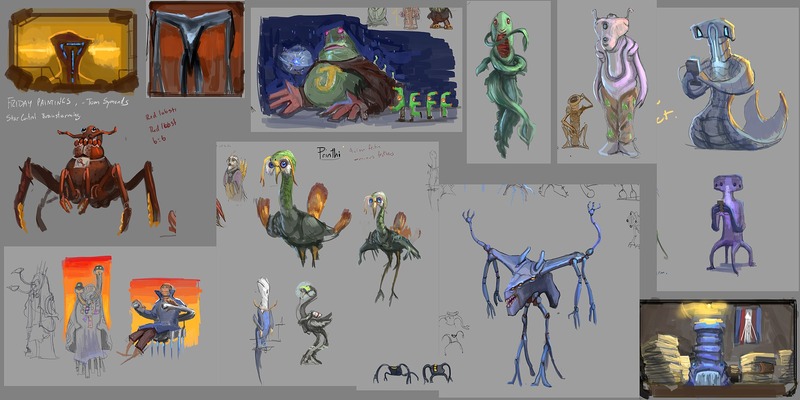 The lead writer, Chris Bucholz, would dream up many different alien species that might fit in Star Control. He'd sketch up a description of what their character was like. Then the art team would come up with many many options for those characters, and eventually something would get picked. Then it came time to finalize what they'd be called. Sometimes, names would get thrown out late in development because we'd discover that we had too many names that sounded similar (Farewell Dan'Nath, hello Xraki!). But in most cases, the lore would be the first step, sketches second, and then naming last. For example, as we begin our adventures, the galaxy (or our part of it) is in turmoil. There are a number of vast criminal organizations out there. 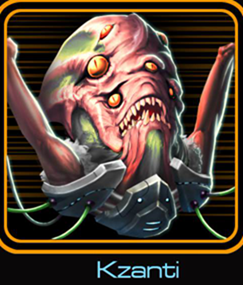 One of the main organizations is now known as the Kzanti, who are entirely new to the Star Control multiverse. They weren't given a name until this Spring (and we almost recycled the Dan'Nath). Similarly, there is also a vast spy network that operates in this part of the galaxy whose influence we are only beginning to grasp. In Galactic Civilizations III, we had the Onyx fill this role. 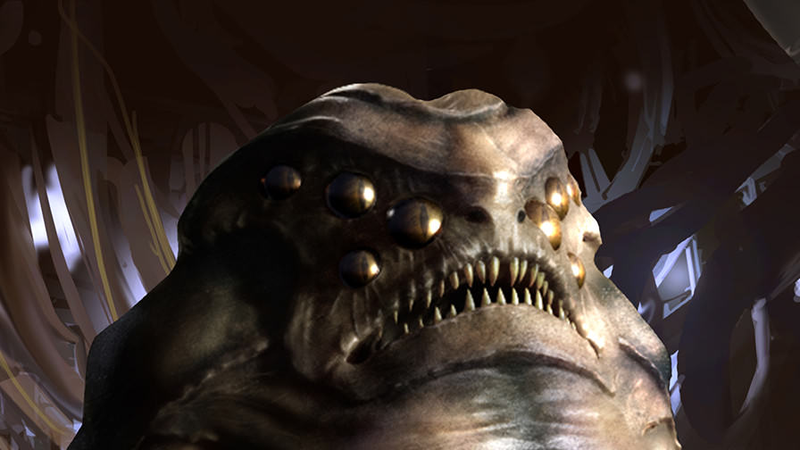 For Star Control: Origins, once it was decided that the Star Control alien names were going to be used, they were branded as the Melnorme. This way, we could make fans happy and support the story's needs. A Melnorme idea that ultimately got assigned to the Trandals. One of our favorite aliens is Jeff. You'll be hearing a lot about him and he went through many iterations as well. Early concept for Jeff the alien. 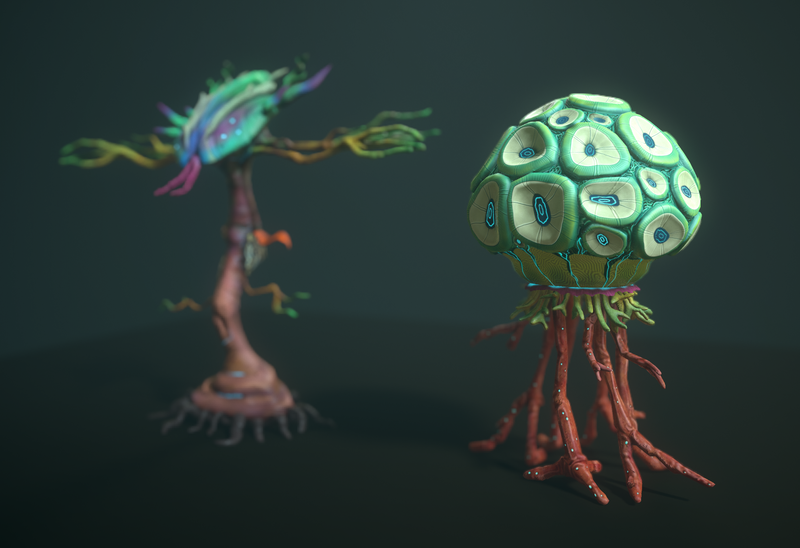 In Star Control: Origins, the Earth is under threat of imminent annihilation and we needed a way to give humans a fighting chance. Thus, we needed a cryptic, Vorlon-like species who would help the humans benefit from the Precursors' left over technology without being active participants in the coming conflicts. 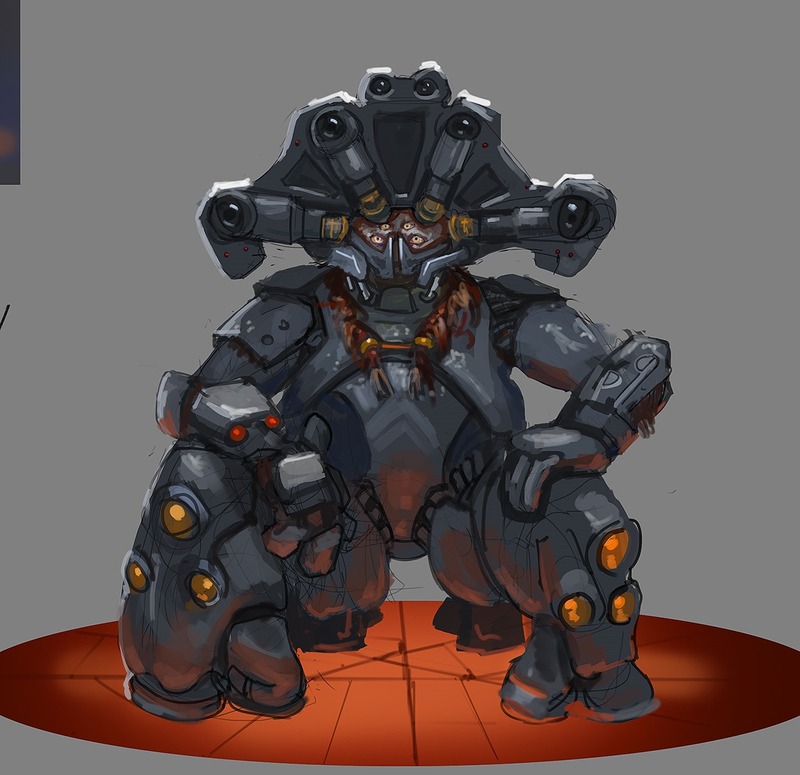 Thus, the Arilou's appearance in the game. We need little green men stat! Once we settled on one, we refined it. 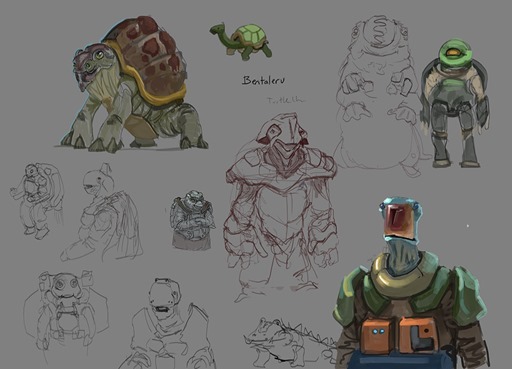 Since it was important that Star Control: Origins not be able to affect the continuity of the Ur-Quan universe (or the Kessari universe) we've taken great pains to make it obvious that the Origins universe has had a very different, somewhat darker, timeline. This way, hard-core fans know that we aren't touching the classic canon and mainstream Star Control fans can be satisfied that the Star Control aliens haven't been forgotten. In the Origins timeline, there was the Eternal War many thousands of years ago. WHAT-IF that war affected the dimensions above and below what we call "true-space" in Origins? 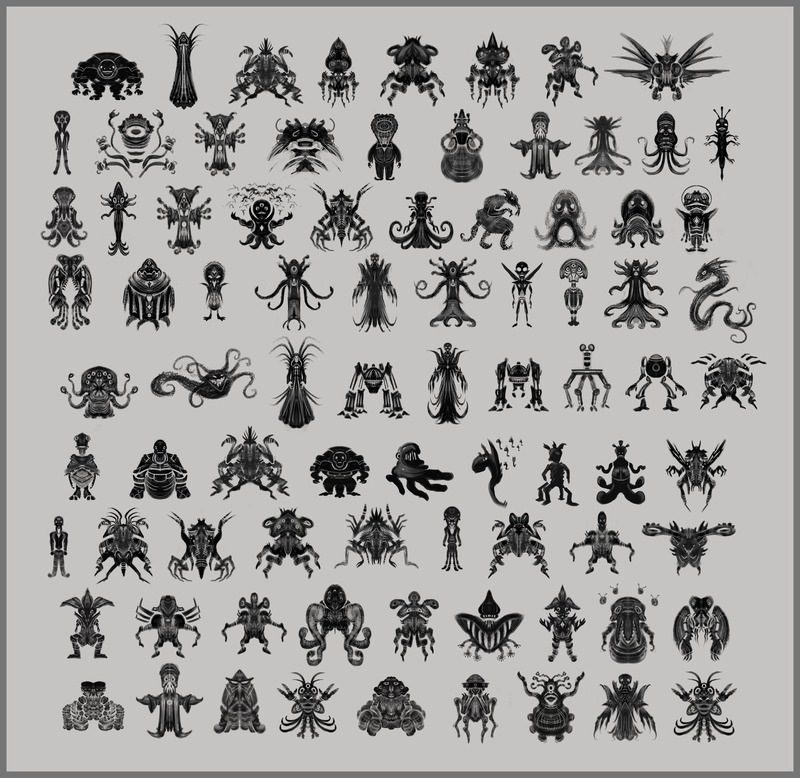 How might it have affected the histories and destinies of those species that lurk out there? As discussed in the last entry, our story focuses (for now) on the "Mid Spur" region of Orion's Spur of the Milky Way galaxy. 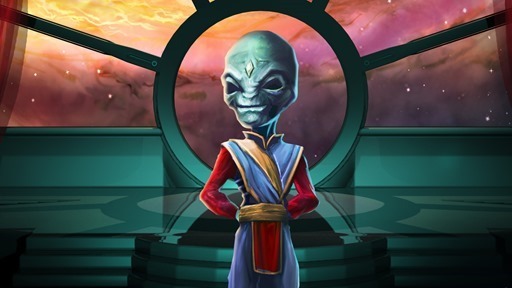 This means that we have many years ahead of us to introduce new aliens to the Star Control multiverse as well as reintroduce the Star Control aliens with our own vision and lore of how they developed. 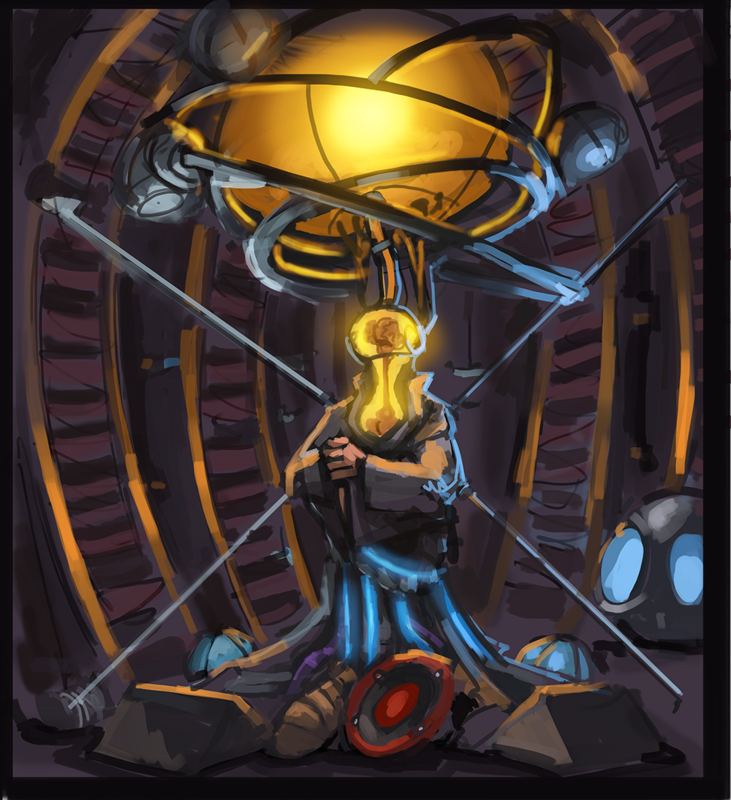 But for those who are absent, we will be making Star Control alien music available as DLC as originally composed and in most cases, remastered by the original creators. This way, the new generation of Star Control fans can appreciate the game's 30 year heritage.